I am always admiring my hair, however long or short they are at different period of time. But what troubles me the most is the time that I need to spend to detangle my hair post headbath. At times I don't even feel like brushing my hair to avoid hair breakage. Actually, I feel there is something that me, the lazy bone, dont do religiously...that is conditioning my hair properly. You see, I rarely liked to use a conditioner in-shower and then wait to rinse it off. 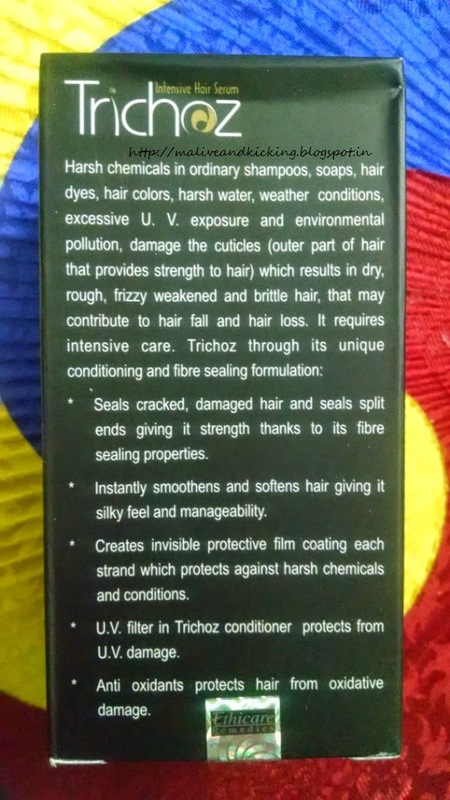 My choice has always been to apply some hair care products which are applied afterward and left in my locks until the next headbath...My search ended when I got a Leave on hair serum named Trichoz made by Ethicare Remedies for dry, tangled, frizzy, unmanageable hair. Polycot-10, Blend of conditioners, hair moisturizers, UV filters, Amino Acids, Anti Oxidant. Pour sufficient amount of liquid on your palm according to your hair length and density. 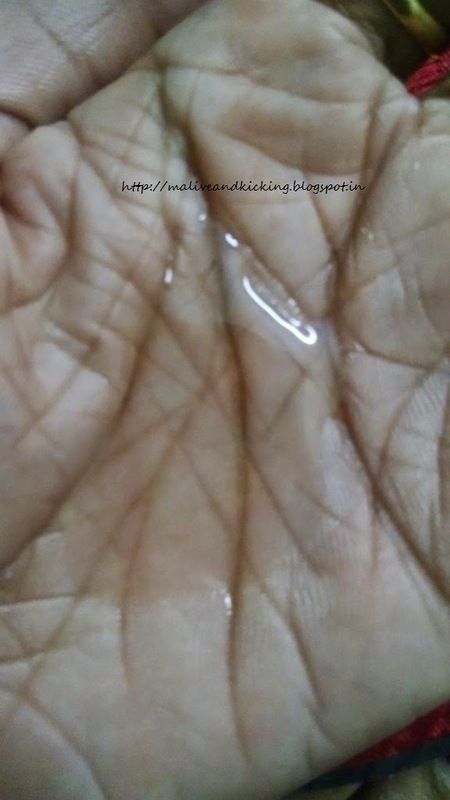 Rub the liquid between your palms and evenly spread it along the hair from top to tip. Do not rinse and just comb directly to style your hair. 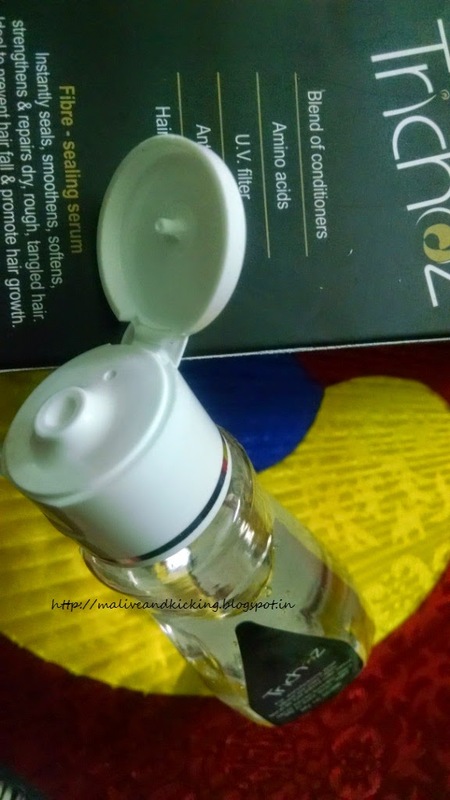 The Trichoz Hair Serum comes in a curvy plastic bottle placed in the black cardboard box. The box will elaborate you on how to apply the hair serum and what effects can you expect after its application. The bottle is labelled with product name and brief description. It has a flip open cap in white color that shuts tightly, so there is no scope of spillage. Hence the packaging is travel friendly too. The hair serum is a non-runny colorless liquid that has bright shine as you pour some on your palm. The texture is very rich and feels no sticky even on hands. 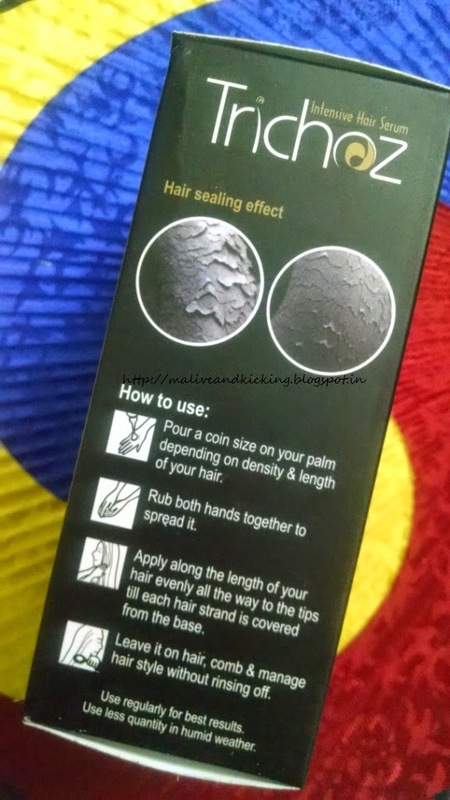 Since there is no rocket-science to be aware of, for applying a leave-on hair serum. Just take care to spread the serum evenly from the base to the tips of hair to cover each strand. 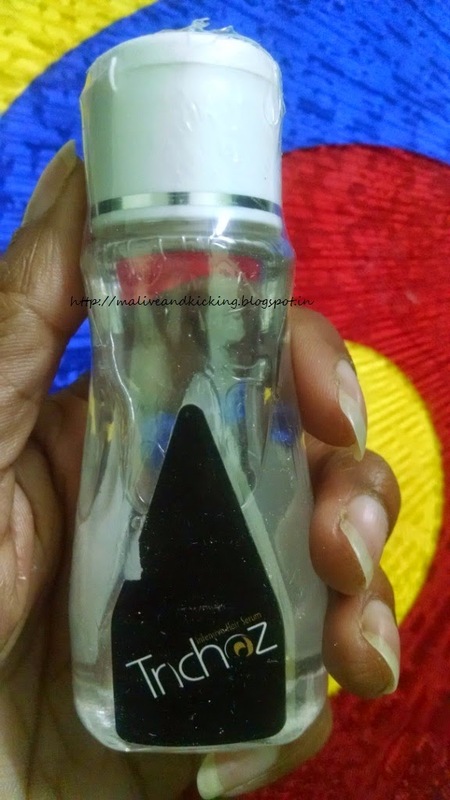 It helped detangle my strands and reduced flyaway. No other product worked so amazing to tame frizz and keep my hair soft and smooth. I swear I feel like none less than a celeb endorsing a promising hair serum with loads of confidence. The consistency of the serum is not too heavy, so it doesn't weigh the hair down or reduces the volume at all. Neither it leaves my hair look greasy. I feel just the right amount of moisture and shine in my hair all the time that is an easy cure for damaged and brittle tresses. 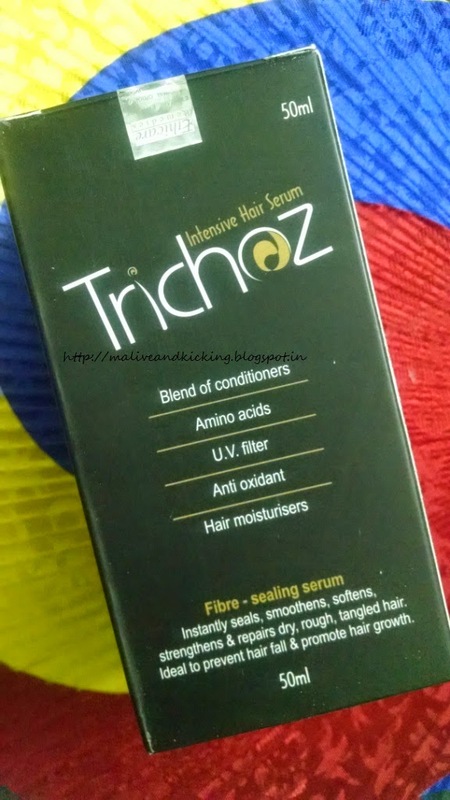 One special mention is to use Trichoz as a styling hair care product, because as I brush my hair after applying this serum, it retains the tresses in same style for quite some time. Requires only coin size quantity per usage. Makes hair look shiny and soft. Doesn't make the hair sticky. Need not to rinse off. Can be used as a styling product. Bit expensive, but worth investing in a good product. I am really liking this product. Sounds quite promising! But I want to try keratin complex shampoo as my dermatologist has recommended that. I just bought it and quite eager to use it. Anyways, thanks for the review!